Everyone deserves a bright, confident smile! That is why we offer our patients Philips Zoom WhiteSpeed, the ONLY in-office procedure clinically proven to safely whiten teeth up to eight shades in about an hour! We also offer our patients a customized take-home whitening kit (DayWhite and NiteWhite), which allows them to continue their whitening after a Zoom Whitening procedure or do “touch ups” if they prefer to do so. Maintain Your Results For a Lifetime! You’ll go home with a kit to keep up your whitening. Each time you see us for your regular cleanings, you’ll receive more gel at no extra cost, so you can maintain your results for a lifetime. We understand that many patients are hesitant when it comes to whitening their teeth because of pain and/or sensitivity. Our Zoom WhiteSpeed LED light provides three adjustable “intensity” settings to manage patient sensitivity. Our hygienists will also apply a special covering to your gums to protect them from the stain-fighting radicals (hydrogen peroxide). Once our hygienist applies a protective gel covering for your gums, she will then apply a unique hydrogen peroxide whitening gel onto your teeth that will break down into stain-fighting radicals and break the molecular bonds making up stains, on and in your teeth. She will then adjust the LED light and position it to shine onto the hydrogen peroxide solution. As the gel breaks down, oxygen enters the enamel and dentin, bleaching the treated areas. Your teeth are not damaged through this process. The light will accelerate the process and help the stain-fighting radicals whiten your teeth faster. Once you have had your Zoom treatment, it is important to maintain a “white diet” for 48 hours to prevent discoloration. Foods/drinks such as white rice, white sauces, white wine, milk, bananas, pasta, and plain chicken are examples of a white diet. Avoid any dark-staining drinks or foods such as coffee, red wine, red pasta sauce, brocolli, chocolate, soy sauce, tea, fruit juice and fruit (except for bananas, apples, and pears). Mouth washes/colored toothpastes also need to be avoided for 24 hours. An easy way to remember is to avoid any foods that will stain a white shirt or foods that have color. White Food = White Teeth! Remember, it’s only for 48 hours, after which you can enjoy your favorite foods again and your white teeth! Why is a White Diet So Important? 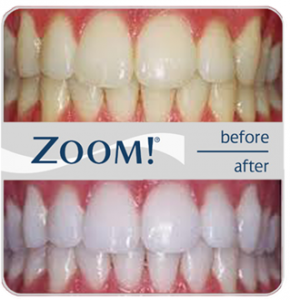 Your teeth have tiny pores that have been opened during the Zoom whitening process. As it takes a couple of days for these pores to close, your teeth can be very easily stained, if you are not careful to avoid colored foods, drinks and oral care items.